The Philippines said on Saturday it had seized a North Korean freighter that was covered by harsher United Nations' sanctions against Pyongyang over its nuclear program. Manila will also deport the vessel's 21 North Korean crew and will await a U.N. inspection team from the United Nations, foreign ministry spokesman Charles Jose said in a text message. "In compliance with the United Nations resolution, the North Korean ship in Subic will be impounded and not allowed to leave port," he said. 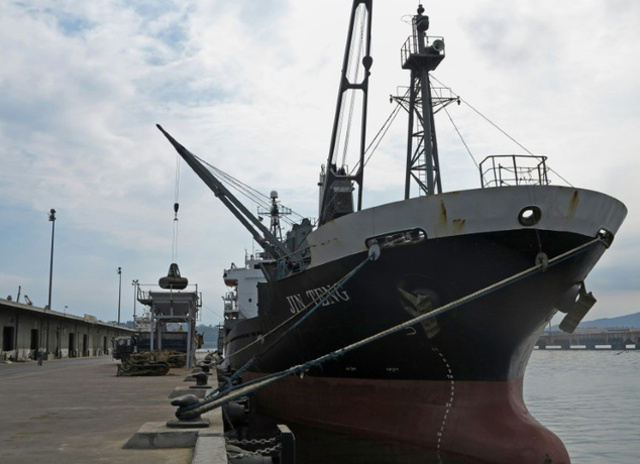 The 6,830 deadweight tonne (dwt) cargo ship Jin Teng was one of the first sanctioned North Korean ships to enter a foreign port since the tightened sanctions were passed unanimously by the U.N. Security Council on Wednesday. Thirty-one North Korean ships are on the list. "The world is concerned over North Korea's nuclear weapons program and as a member of the UN, the Philippines has to do its part to enforce the sanctions," said Manolo Quezon, deputy presidential spokesman told reporters. The ship, flying a Sierra Leone flag, arrived on Feb. 27 and was unloading palm kernels. "We have sent teams to guard the ship until we get the formal order from the government," said Commander Armand Balilo, coast guard spokesman. On Friday, the coast guard barred the ship from leaving port, citing safety deficiencies found during an inspection. The inspection was conducted after the U.N. passed the resolution against Pyongyang. The U.N. resolution said the 31 ships were "economic resources controlled or operated by Ocean Maritime Management and therefore subject to the asset freeze". The Jin Teng has called at Palembang, Indonesia, and Kaohsiung, Taiwan, since the beginning of this year, ship tracking data showed.